The Cobb Point Bar, also know as Cobb Island Bar, was a square cottage screwpile that was pre-fabricated at Lazaretto Depot using the same plans as the light at Tangier Sound in Virginia. The pre-fabricated sections were brought to the site and assembled in a little over 30 days. The lighthouse was commissioned on December 25, 1889. The light had a fourth order Fresnel lens that displayed a fixed white light. The cost of the lighthouse was $15,000. 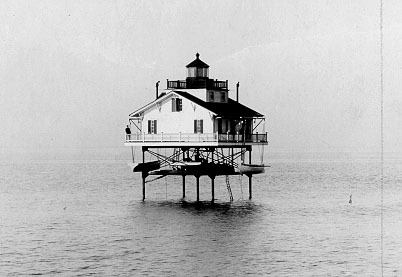 The lighthouse was demolished in 1940 after being heavily damaged by fire in 1939. Photo courtesy of the Coast Guard. The current light is a small navigation beacon mounted on the original foundation. On nautical charts, this area is called "Lighthouse Lumps". Located off Cobb Island at the western entrance to the Wicomico River; visible from many points on the south side of Cobb Island (end of MD 254). Take MD Route 301 south through Waldorf, MD. Turn left on Rock Point Road. Then right onto Cobb Island Road.